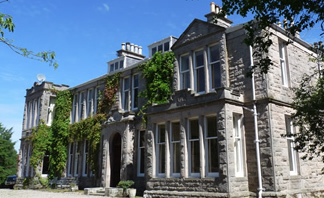 Ardgye House B&B Elgin offers luxury Bed & Breakfast Accommodation, Corporate Events & Private Parties. Situated near Elgin in the heart of Morayshire. Ardgye House is one of the finest examples of Edwardian architecture to be found of its type. This gracious mansion house stands in 150 acres of it's own grounds and enjoys an exquisite panoramic view over the beautiful Laich of Moray and out across the Moray Firth to the rolling hills of Sutherland in the North. It's idyllic woodland setting supports a variety of flora and fauna. Beautiful rhododendrons, cherry trees and daffodils take pride of place. A stroll through the grounds may be further rewarded by sightings of deer, ducks, squirrels, badgers and foxes. We are only 5 minutes drive from Elgin town centre.
" Fantastic mansion, enormous room, friendly hosts ... "